Why Ulta Beauty, Guess, and Big Lots stocks could make big moves over the next few trading days. Stocks gained more than a full percentage point in abbreviated trading last week in a rally that pushed the Dow Jones Industrial Average (DJINDICES:^DJI) to a near-10% gain for the year while the S&P 500 (SNPINDEX:^GSPC) lagged slightly with its 8% increase. The week ahead could bring volatility for shareholders in Ulta Beauty (NASDAQ:ULTA), Big Lots (NYSE:BIG), and Guess (NYSE:GES) as each company is set to post fresh earnings reports over the next five trading days. Investors are expecting good news from beauty retailer Ulta on Thursday. The company recently raised its growth forecast to between 14% and 15% -- from the 11% to 13% prior projection. If it hits the top end of that guidance, Ulta will have booked a record growth pace in two of the last three quarters. The key to its market-beating expansion has been impressive customer traffic gains. Ulta last quarter enjoyed a 10% boost in visitors to mark just a tiny decrease from the prior quarter's 11% spike. A surging e-commerce business is helping as well, given that online sales were up 55%. CEO Mary Dillon and her executive team believe they can boost earnings by over 20% in each of the next three fiscal years. The company also just raised its long-term comparable-store sales forecast to 8% from 6%, which implies that executives see the current industry upswing lasting at least through 2019. 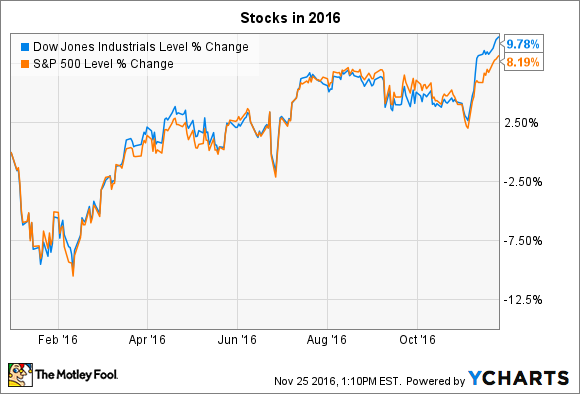 Sure, the stock has responded to that improving outlook by rising more than 25% over the past six months. But the rally is likely to continue if Ulta keeps soaking up market share in the fast-growing beauty industry. Guess shareholders have endured plenty of volatility this year. After touching multiyear lows, their stock surged 22% immediately following the previous earnings report in late August. That burst of optimism came as the retailer outperformed management's comps growth target while projecting accelerating gains ahead. "The transition is now behind us," CEO Victor Herrero declared as Guess produced a minor uptick in both comps and profitability. Wall Street isn't buying the turnaround story yet, though, as shares slipped in the three months following that report. After all, Guess is still suffering from declining comps and an operating margin that's well below its historical average. In that way, it's no surprise that the stock is down significantly heading into this week's earnings announcement. Trends could turn sharply positive again if the retailer shows another quarter of sales and profit improvements and at least affirms its outlook heading into the industry's biggest quarter. Following two straight years of declines, discount retailer Big Lots has enjoyed 10 consecutive quarters of comps growth heading into Friday's earnings announcement. It only barely kept that streak alive last quarter, though, as the expansion pace slowed from 3% to 0.3%. On the other hand, the company outperformed executives' earnings target by a mile, thanks to a $39 million improvement in operating profit that pushed its margin up to 3.2% of sales from 2.5 %. CEO David Campisi and his team have forecast a similarly weak but positive operating trend for this quarter. Comps should come in between 0% and 2%, according to executives. Investors will be more interested in Big Lots' updated thoughts on the holiday quarter. In late August, management forecast comps of between 1% and 2% for that critical period. Big Lots hopes to keep customer traffic trends ticking higher despite increased competition by improving its shopping experience and focusing on product categories, like furniture, where it holds a solid competitive advantage. Longer-term, shareholders are looking for healthy growth to come from its just-launched e-commerce presence.